The White-throated Sparrow is often overlooked in a flock seemingly populated by House Sparrows despite its striking field marks. The next time you encounter a gathering of sparrows, give it a closer look, preferably from a distance with binoculars. The White-throated Sparrow is a winter bird in New York City. 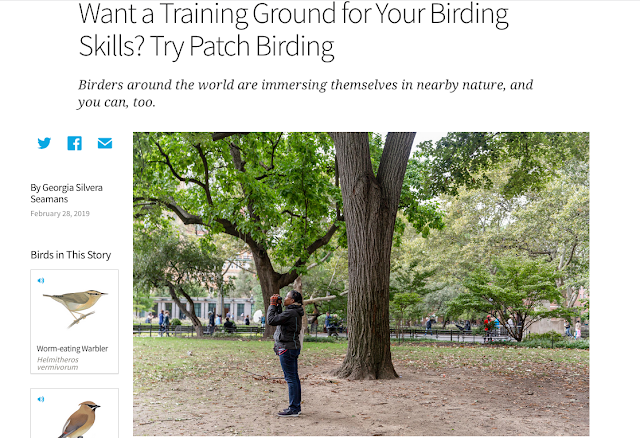 I observe them often in my favorite birding patch, Washington Square Park. The species is one of fourteen species recorded in the park this winter. Another hotspot for them in my neighborhood is the Washington Square Village Sasaki Garden. The birds that winter in our area will migrate northward for the breeding season. When I look at data from September 2016 to February 2018, there are big population spikes between October and February and the number of individuals drops dramatically in the intervening months. A member of the New World Buntings and Sparrows, the White-throated Sparrow is in the same family as birds such as Fox Sparrow, Dark-eyed Junco, White-crowned Sparrow, and Swamp Sparrow. I specifically listed these four species because they have been observed in Washington Square Park. The presence of three field marks and a foraging behavior are distinctive of the White-throated Sparrow. Like the White-crowned Sparrow, it does have a bold black and white crown. Similar to the Song Sparrow, the tan-morph of the White-throated Sparrow has tan crown stripes. However, no other related species has the combination of black and white crown stripes, bright white throat patch, and yellow lores, though the latter feature is less noticeable in the tan morph. I'll take about morphs more below. A friend refers to the species' foraging behavior as the "White-throated Sparrow shuffle". Don't the toes look perfect for scratching and disturbing leaves? Coming back to the presence of morphs in this species -- the White-throated Sparrow is polymorphic. This plumage polymorphism is unaffected by age or season. Both sexes exhibit the trait; you will find male and female exhibiting white-stripe and tan-stripe crown plumage. One fascinating aspect of this polymorphism is its role in mating preference. Males of both morphs prefer the white-stripe female while females of both morphs prefer the tan-stripe male. The female white-stripe is more aggressive than her tan-morph counterpart and will outcompete her for a tan-morph male. The white-stripe female's territorial behavior is more attractive than the passive boundary making behavior of the tan-stripe female. The tan-stripe male is the desirable mate because he is more involved in nesting activities. These factors contribute to the bi-morphic pairings observed during the breeding season. Its wings are not among its defining field marks. Yet, I am struck by their beauty: coverts of mostly black vanes with edges of russet and tipped with white to form two sets wing bars. What do you think?